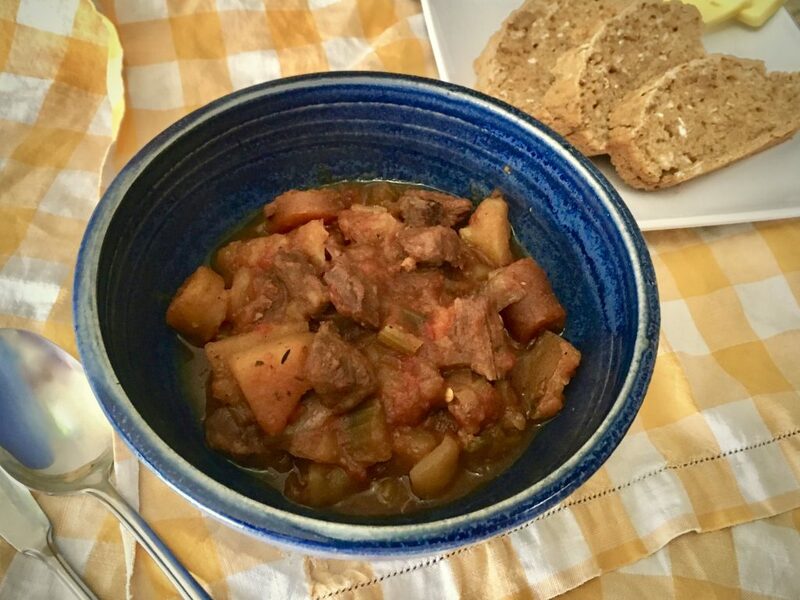 Combine bison stew meat, stout beer, salt and baking soda in a medium bowl and refrigerate overnight. Spread chopped potatoes, onion, and carrots out on a baking sheet. Sprinkle minced garlic, thyme and melted butter on top. Put in oven for 20 minutes or until brown, but careful not to burn the garlic. Heat 1Tbs butter in cast iron pan on medium heat. Drain stout from bison stew meat and brown meat. Combine all ingredients in a large pot or slow cooker. Place on medium-low heat for at least 3-4 hours. Salt and pepper to taste. Serves 4-6.